SAFE water travel, at speeds that only the most daring race pilots now attempt, is brought within reach of everyone by a radically new type of water craft. 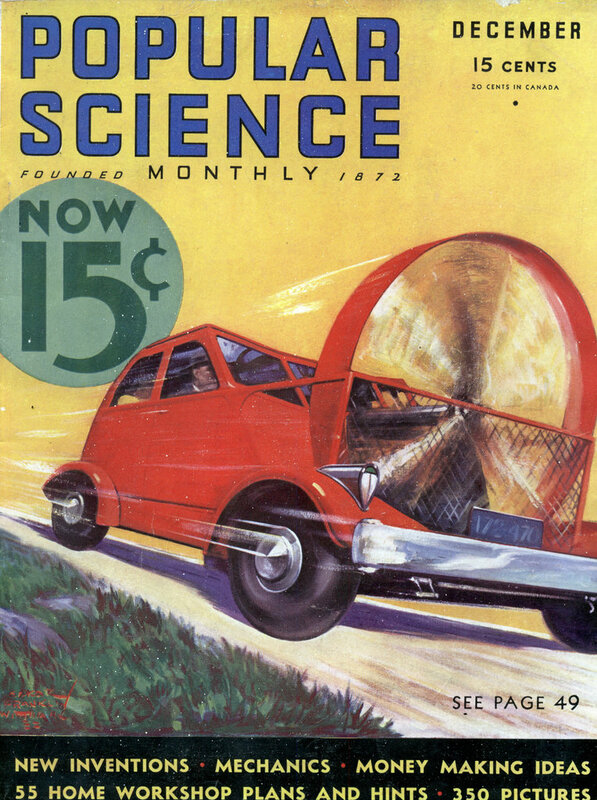 When suitable motors are installed, the inventor expects it to shatter all records and attain 150 miles an hour. Despite its swiftness, the airplane-shaped boat demonstrated extraordinary stability in its first trials on Long Island Sound, N. Y., the other day. It amazed marine experts among the spectators by turning around in its own length, at high speed, without upsetting. 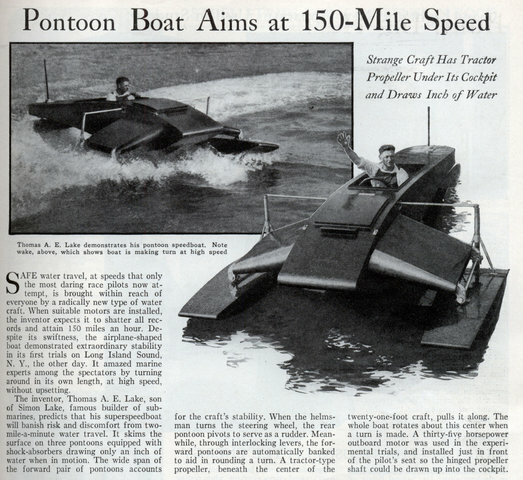 The inventor, Thomas A. E. Lake, son of Simon Lake, famous builder of submarines, predicts that his superspeedboat will banish risk and discomfort from two-mile-a-minute water travel. It skims the surface on three pontoons equipped with shock-absorbers drawing only an inch of water when in motion. The wide span of the forward pair of pontoons accounts for the craft’s stability. When the helmsman turns the steering wheel, the rear pontoon pivots to serve as a rudder. Meanwhile, through interlocking levers, the forward pontoons are automatically banked to aid in rounding a turn. A tractor-type propeller, beneath the center of the twenty-one-foot craft, pulls it along. The whole boat rotates about this center when a turn is made. A thirty-five horsepower outboard motor was used in the experimental trials, and installed just in front of the pilot’s seat so the hinged propeller shaft could be drawn up into the cockpit. I met and knew Tom Lake in the 1960s when I worked at Piasecki helicopters. I visited him at his home in Milford, CT on several occassions where he showed me the submarine test models he and his father made stored in the garage. Simon Lake was personal friends with Henry Ford and Edison. The boat shown in the picture was able to be a high speed torpedo attack boat that could turn on a dime. What was accepted was the “PT’ boat. I still have in my possession an advertisement sheet on this boat Tom gave me !